If you're working to build a versatile, timeless, and fashion-forward summer wardrobe, then we caught you just in the nick of time because it's certainly not an easy task. Narrowing down your shopping picks to only those trendy yet classic essentials that you'll wear more than once requires a lot of restraint—and a little bit of guidance in terms of must-have items that yield a great cost per wear. Ranking in at the top of the list of items everyone should own in their wardrobes for the warm-weather months is a pair of linen pants, a minimalist shirt you can wear with everything, a good pair of canvas sneakers, and last but certainly not least, a collection of black crop tops—and we found the best of the latter below. From a '90s-inspired halter to a super-cool off-the-shoulder style, these black crop tops certainly deserve a spot in your outfit rotation. As for how to wear them? Pair them with crisp white denim, cutoff jeans, your favorite shorts, or a fun mini, midi, or maxi skirt. The styling options are truly endless, which is why we highly suggest investing in one (if not more). 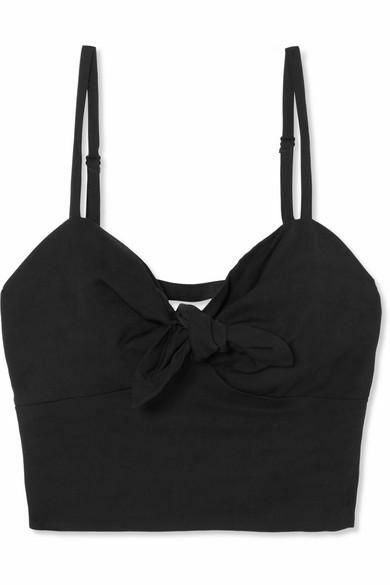 Read on to scoop up the best black crop tops of the summer. Available in sizes 4 and 8. Available in sizes IT40 to IT42. Available in sizes IT46 to IT48. Available in sizes S and L.
Available in sizes BR36 to BR40. Available in sizes IT38 and IT42. Available in sizes XS and L.
Available in sizes UK8 to UK12. Next up, shop the absolute best white jeans to wear with your stylish new crop top.